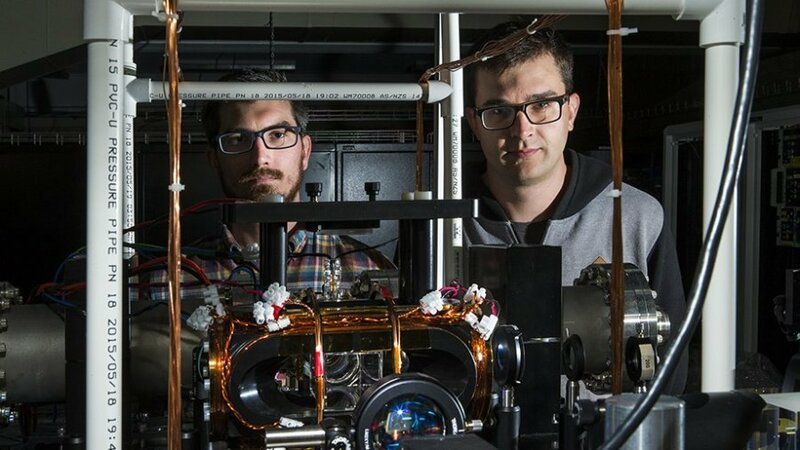 Physicists at The Australian National University (ANU) have brought quantum computing a step closer to reality by stopping light in a new experiment. Dr Geoff Campbell and Mr Jesse Everett. Lead researcher Jesse Everett said controlling the movement of light was critical to developing future quantum computers, which could solve problems too complex for today’s most advanced computers. “Optical quantum computing is still a long way off, but our successful experiment to stop light gets us further along the road,” said Mr Everett from the Research School of Physics and Engineering (RSPE) and ARC Centre of Excellence for Quantum Computation and Communication Technology at ANU. He said quantum computers based on light — photons — could connect easily with communication technology such as optic fibres and had potential applications in fields such as medicine, defence, telecommunications and financial services. The research team’s experiment — which created a light trap by shining infrared lasers into ultra-cold atomic vapour — was inspired by Mr Everett’s discovery of the potential to stop light in a computer simulation. “It’s clear that the light is trapped, there are photons circulating around the atoms,” Mr Everett said. Mr Everett likened the team’s experiment at ANU to a scene from Star Wars: The Force Awakens when the character Kylo Ren used the Force to stop a laser blast mid-air. “It’s pretty amazing to look at a sci-fi movie and say we actually did something that’s a bit like that,” he said. Associate Professor Ben Buchler, who leads the ANU research team, said the light-trap experiment demonstrated incredible control of a very complex system. “Our method allows us to manipulate the interaction of light and atoms with great precision,” said Associate Professor Buchler from RSPE and ARC Centre of Excellence for Quantum Computation and Communication Technology at ANU. Co-researcher Dr Geoff Campbell from ANU said photons mostly passed by each other at the speed of light without any interactions, while atoms interacted with each other readily. “Corralling a crowd of photons in a cloud of ultra-cold atoms creates more opportunities for them to interact,” said Dr Campbell from RSPE and ARC Centre of Excellence for Quantum Computation and Communication Technology at ANU. “We’re working towards a single photon changing the phase of a second photon. We could use that process to make a quantum logic gate, the building block of a quantum computer,” Dr Campbell said. The research was supported by funding from the ARC Centre of Excellence for Quantum Computation and Communication Technology, which involves ANU, University of New South Wales, University of Melbourne, University of Queensland, Griffith University, University of Sydney, Australian Defence Force Academy, along with 12 international university and industry partners. The results from the experiment are published in Nature Physics. Web Source: Australian National University.